Mindport Exhibits hosts the Speak Easy 4 poetry reading during the August 6 downtown Bellingham Art Walk. Readers include three past Sue Boynton Contest winning poets – Nancy Canyon, Rena Priest and Scott Stodola – as well as poets Sue Johnson and Paul Sarvasy. Each poet will read for 4 or 5 minutes at a time and there will be an opportunity for the audience to come and go between readers. Drop by for a set or for the whole event! Nancy Canyon, visual artist and author, is published in Floating Bridge Review, Fourth Genre, Mainstreet Rag, Poetry South, and forthcoming in Water-Stone Review. She is a Fiction Editor for Crab Creek Review, writing instructor for Whatcom Community College and Western’s Academy for Lifelong Learning, and a massage therapist in private practice. She holds the MFA in Creative Writing from Pacific Lutheran University and is currently revising her third novel. Rena Priest is a poet. She is constantly falling in love with the swoon of a curve in the road, the duende of people who wait passionately in lines, the wabi-sabi of perfectly chipped teacups… Her work fearlessly examines ridiculous people, people in love, ridiculous people in love, and very serious people (in love and out). She holds an MFA in writing from Sarah Lawrence College and is presently completing her first full-length book of poems. Scott Stodola, educator, poet, grandfather, has several collections of poetry. He has been published in LD Books and the Beacon Review, and was a winner in the 2006 Sue C. Boynton Poetry Contest. He is co-innovator with Matt Christman, of Phrasings, a collaboration with the Bellingham Repertory Dance Company. Other collaborations include The Long Body, a gallery show with graphic artist Paddy Bruce, and The Gardening of Art, a display, installation and reading with CSWT and area visual artists. Sue Johnson was born in England and emigrated to the U.S. in 1991. Her degree is in Mathematics but after graduating she traded all her used text books for the New Oxford Book of English Verse. Sue has always loved to write. After moving to Bellingham in 2005, she began the gradual shift from accounting to creative writing. Sue is working towards her dreams of being a published poet and mystery novelist. Much of Paul Sarvasy‘s poetry is an attempt to grapple with the myriad layers of his work as a physician. Always in the background is the HIV epidemic. For a number of years, he met monthly with a group of family practice doctors in training to read poems on death and dying and talk about their experiences. your genetic code has been. bright and leathery fruits of our differences. *Copyright 2007 by Angela Belcaster. This poem appears in POETRY WALK: Sue C. Boynton Poetry Contest – The First Five Years. Info: Book! 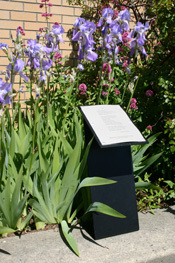 The 2010 Walk Award plaques are now in place on the Sue Boynton Poetry Walk in front of the Bellingham Public Library. They’ll be there for a year, until they are replaced by the 2011 winning poems. In addition to the ten poems, a permanent plaque displays a Sue C. Boynton poem, “This Business of Growing Old Bothered Me Once,” and another acknowledges this year’s major donors. That the world is worth saving. *Copyright 2010 by Keajn Wardrop-Peterson. This poem appears in POETRY WALK: Sue C. Boynton Poetry Contest – The First Five Years. Info: Book! How many birds are in a flock? How many flocks are in the sky? Do birds fly in the fog? Do they ever get lost? Or feel lonely? Or triumphant? If I lose my way in the woods, what do I do? What map do the birds follow? and understandable only to sensitive avian feathers? reeling on its collective side, underbellies upturned? Do birds know they reel together? only from our fixed point of view? Do humans connect through chaos too? Which tender feathers do we expose? so greedy with gravity we actually seek collision? How do we learn to tilt, land, fly again? Is it important we are one species? Are there edges to the sky? *Copyright 2010 by Karee Wardrop. This poem appears in POETRY WALK: Sue C. Boynton Poetry Contest – The First Five Years. Info: Book! *Copyright 2010 by Jose Valenzuala. This poem appears in POETRY WALK: Sue C. Boynton Poetry Contest – The First Five Years. Info: Book!